One of the much hyped features of .NET 3 is Windows Presentation Foundation (WPF), a graphical subsystem framework, which includes (amongst other things) a markup language binding called XAML (which is really a rip off of XUL which has been the core of Mozilla/Firefox for years, but that's another story :)). A couple of days ago the Eclipse foundation released a new version of Eclipse called Europa. It has some cool new features, one of which that caught my eye is a port of the Eclipse native widget set SWT to WPF. For fun I thought it would be interesting to see how hard it would be to "port" a WPF example to SWT/WPF. which displays two buttons that change color when focus changes. So, what does the equivalent SWT/WPF look like? SWT/WPF currently has support for configuring Resources via XAML, but top level Controls like Button, Label, etc must be defined using the equivalent SWT widgets. // Set up the event loop. In the example above I XAMLize the style of the first button and leave the second button with the default style. SWT/WPF support is a bit raw right now but shows a lot of promise. "...language binding called XAML (which is really a rip off of XUL which has been the core of Mozilla/Firefox for years, but that's another story :))..."
I'm sure Netscape's idea for XUL wasn't original at the time (as you said, SGML pre-dates HTML and XML), it was just the first large-scale application written to use XML for 'widget' layout that I'm aware of. did u ever try to extend your example to even more ? 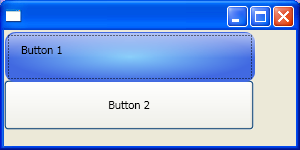 then all button childs get the xaml rendering that you specify in the ResourceDictionary. My next test was to do that for labels and text fields. Also no problem really. But I couldnt figure out was how to combine a button and a text or label specification in one resource dictionary so that I could specify that on the Shell level and sort of use XAML for theming a whole application. That would be really cool. I can do that if I set an individual resource dictionary for every instance of button,lable and text but that is a bit resource expensive. Also I am looking for the list what XAML element is mapped to what SWT control. So i.e. what is right XAML style for a Composite (say the view composite). maybe you played around with it a little more and have some insight or some pointers. Unfortunately I haven't had the time to explore the SWT/XAML integration beyond the simple example in this blog post. I would recommend you either read through the source code (which is how I was able to figure out stuff for this example) or I bet there is an SWT forum you could pose a question to. If you discover more about the SWT/XAML integration please let me know and I'll be happy to link to anything you blog about it! I was trying to modify the button text alignment to center using the ResourceDictionary. Found that "HorizontalContentAlignment" is the style property to set the alignment. any one has a idea why this is not working?